Cherokee Pass, MO – It was a cool, breezy morning in mid-March. 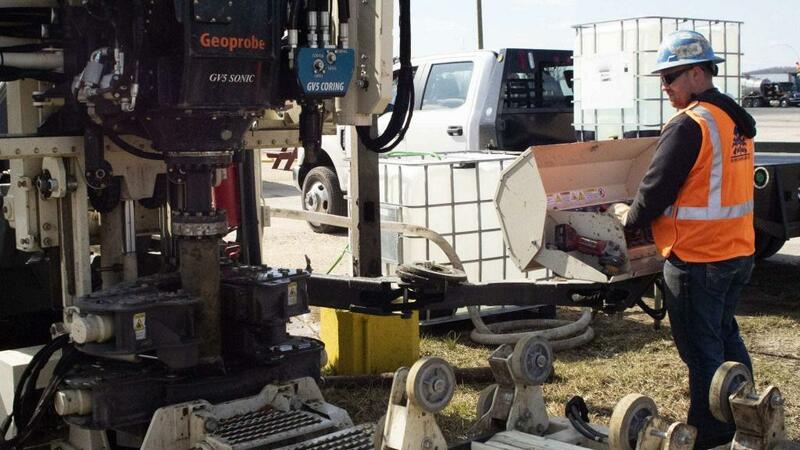 Environmental Works Inc.’s brand new GeoProbe sonic drilling rig was in place and the drill positioned to break ground on a well site that had been giving our drilling team issues for years. They had been to the site at least once a year for the past three years, trying to set deep 100-foot monitoring wells in a rocky, but unconsolidated subsurface. The weathered dolomitic rock intervals were too hard for augers to chew through; and the clay in-between too muddy for air rotary to work. The only success they’d had was in discovering that problematic drilling environments like Cherokee Pass require a more technical solution. But, with the sonic rig on site, this time felt different. Daniel Yoakum, our drilling department manager, guided the drill down until it cut the ground. The rest of the team held its collective breath. The drill cut right through the wind, and the ground like butter. It made quick, clean work of the clay, bits of dolomite and unconsolidated material that made up the first ten feet of the subsurface. The remainder of the well drilled the same, with no downhole issues, no shoveling waste, and no down-time. The team could breathe a sigh of relief. By afternoon, the team had bored the 120 feet required to take water quality readings from the well site. Even more remarkable, the site was impeccably clean. The cores from the well had been collected in neat, compact tubes of material with very good recovery, and laid in rows for Bob Lanning, our senior geologist, to log. The versatility and cleanliness of a sonic drill rig is what sets it apart from other drills that simply move earth and crush rock. “(Sonic) uses high frequency, and vibration to drill instead of hammering. This leaves the soil almost undisturbed,” explained Trevor Lowry, our drilling geologist and Cherokee Pass field supervisor. Sonic drill rigs can core bedrock, as well as unconsolidated materials, making them ideal for the geologically diverse and varied sites of the Ozarks and greater Midwest. As an added bonus, they are much “greener” than an auger or air rotary drill, producing about a third of the drilling waste of a conventional drill, all contained and controlled in plastic liners. “The air or mud rotary produces a lot of waste, which is bad for the environment because the waste can potentially include hazardous materials, which are hard to contain as they are coming from the borehole, and add additional cost to your project” said Lowry. As the only company licensed in Missouri, Arkansas, Illinois, Nebraska, Iowa, Kentucky or Kansas with a sonic drilling rig, we are your source for sonic drilling and sampling in the Midwest. Our team is highly skilled, organized and professional. Interested in our sonic drilling services? Give Daniel Yoakum, Drilling Department Manager, a call at 913-333-1853 for a free consultation.